Coffee and a Book Chick: Guess Who's Going to be Reading for Two...? Guess Who's Going to be Reading for Two...? That's right, my friends. What our sweet Roma is trying to communicate to you all is that this chick right here is five months along and will be reading for two very soon. Actually, I'm already reading aloud to the little one (but sometimes I skip the scary parts if it's a Stephen King book). My husband and I will welcome our first baby, A BOY, in November. I cannot tell you how thrilled, nervous, and excited I am! And here's the baby bump! This is a hockey house, and my husband just finished his game in the local league here in Virginia Beach. 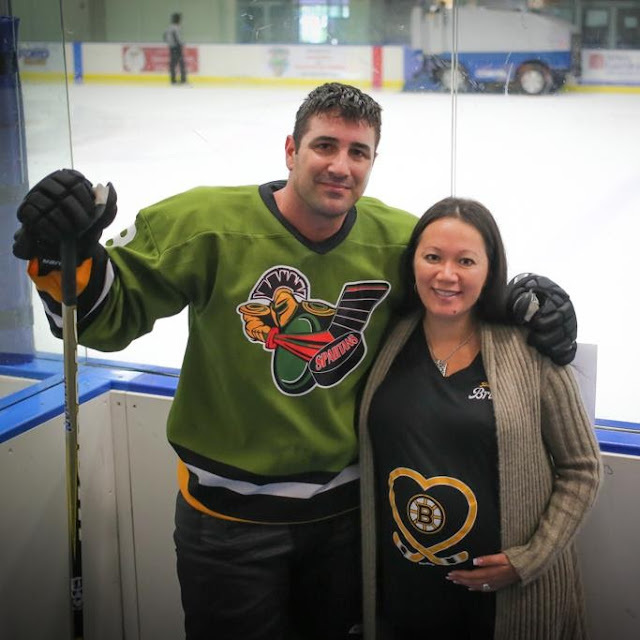 I'm sporting the Boston Bruins' maternity shirt he got me which has the hockey sticks shaped into a heart over the belly. Can you tell that we hope our little boy plays hockey when he gets older? 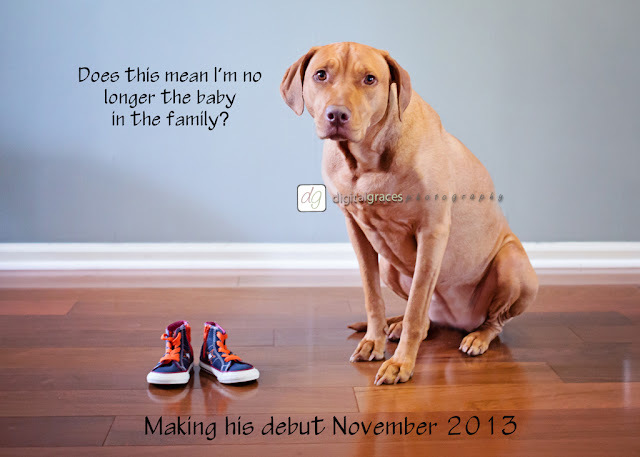 A special thank you to my incredibly talented sister for taking both photos and then doing all of her editing tricks to produce this one-of-a-kind announcement (I love the caption!). 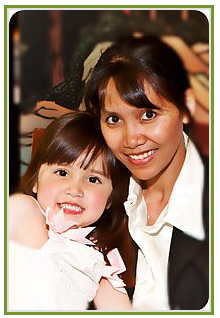 You can visit her at any of the below for her photo advice, children's portraiture, artistic shots, and more! Congratulations! Children's books are wonderful - you'll have a lot of fun investigating them and with a sister that good at photography you'll have the cutest baby photos ever! Good luck! You are about to embark on the best journey ever. I love the announcement btw. It's cute, playful, and unique. Congratulations!! Very cute announcement, too! Well, hotdog! A new baby! Congratulations to you both ... stay healthy and enjoy this special time! Congratulations! And I love the announcement! Oh yay! How exciting and fantastic!! Congrats to you both! Wonderful! Congratulations to you both! You will be adding a whole new level of reading pleasure to your life as you explore books with your child. Oh! My! Gosh! I was so excited to see this in my feed! Congratulations, girlie. You look amazing, and I can't wait to see your adventures with your little family. Congratulations! Being a mom is such a blessing. I love that announcement. So cute! Congratulations! Congratulations!! Cute announcement and great picture of you guys! Oh, congratulations!! Little boys are so very sweet! :D I love that hockey maternity shirt, too! Ooh, that's so exciting! Congratulations! Awwww... a November babe. How awesome! Congrats to you!! OK I am scrounging for Internet in Poland and can't comment much but I could not resist doing it here. Congratulations!!! You will make such good parents. I am SO happy for the two of you! I'm so happy for you and your family: the dog, the husband and the son to come. It is such a joy to have a boy, mine has blessed me for 22 years even though many of the last few we're traumatic high school moments! This is wonderful news to announce, and I'm so glad you shared it with us. Plus, add your beauty to your husband's handsomeness? What a blessed boy to be! Congratulations! This is going to be the most well read baby boy ever! I just saw a picture on Instagram and wondered how I missed the news. SO EXCITED FOR YOU!!!!!!!!!! Being a mom it's not always easy but it is the best. Congratulations to you and your husband. Roma will adjust. We couldn't find our lab the other morning and finally found her curled up in Elle's bedroom. She starts off at in our room at night so I had no idea she'd been sneaking away. I'm sure Roma will fall in love, too. Very exciting!!! Congrats!! If you squeeze in another pre-baby readathon ... lmk. Had so much fun #DomeAlong. Just saw this post -- oh my gosh, Natalie, congratulations! I am so happy for you. There is nothing like reading to your baby. My 19- and 13-year-old daughters still recite their favorite picture books by heart -- and it still makes me smile every time! Hugs! Congratulations, Natalie to you and your husband. This is fantastic news! I imagine you are extremely excited. I love the announcement, your sister did a terrific job! I am part of a hockey house, too! (New York Rangers, here!0 So I just love your sweater with the heart...great! Awesome photo with your husband, too. Maybe you'll take a similar when your little boy arrives...do you have a sweater for him?! !